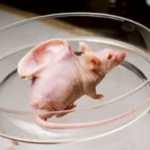 grafting dead fetus parts onto mice which are then used to test drugs. States and it has been dubbed “Frankenstein” science. administration to reassess if the practice should be continued at all. taxpayers’ money into using aborted babies in the name of science.